Our cool season weather and dormancy of our great oak trees allows us to now begin Oak Trimming Season. 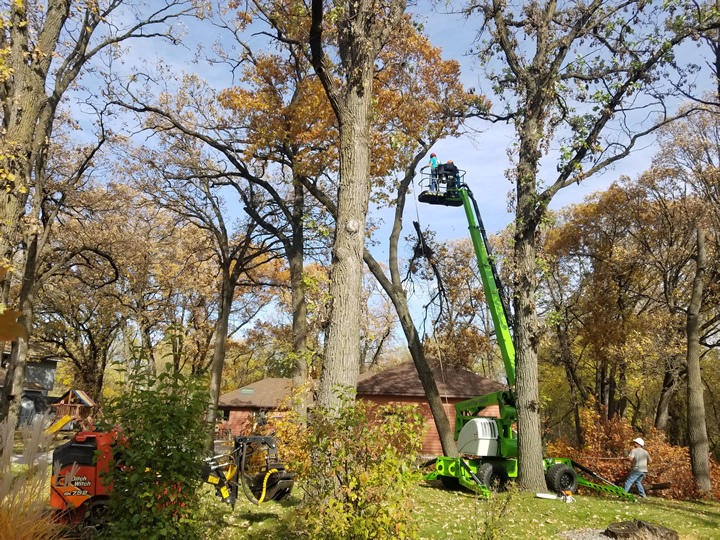 The professionals at Pioneer Tree Service will do an outstanding job pruning out dead, diseased, or otherwise nuisance branches and limbs. Yes, we can tell what branches are dead even if there are no leaves left on the tree! The University of Minnesota's web site has information on the pros of pruning large established trees during the cooler fall and winter months (see https://www.extension.umn.edu/garden/yard-garden/trees-shrubs/pruning-trees-shrubs/). Michigan State University also recommends "Protecting oaks from wilt disease starts with restricting times trees are pruned to the cold weather season." Pioneer Tree & Landscaping, Inc - Now Trimming Oaks. Call (763) 238-5254 for a free quote on one tree or whole yard trimming.